A few cells have developed over central parts of NSW mainly on the ranges so far. The soundings this morning suggest good potential for hailstorms with the dry air aloft and nice lapse rates. For people in the ILLAWARRA, CENTRAL TABLELANDS and parts of the HUNTER, SOUTHERN TABLELANDS and CENTRAL WEST SLOPES Forecast Districts. Issued at 2:13 pm Tuesday, 26 February 2008. Severe thunderstorms are likely to produce large hailstones and damaging winds in the warning area over the next several hours. 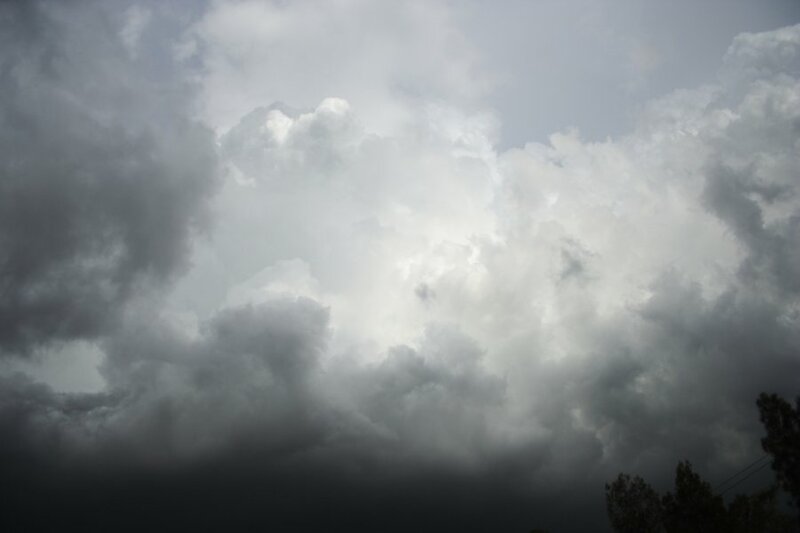 Locations which may be affected include Nowra, Orange, Mudgee, Bathurst, Katoomba and Goulburn. Just heard over the police scanner that it's hailing at Albion park, No indication of the size of the hail. The storm tracked up the coast and at the moment is hitting just north of Wollongong. Hear at Albion Park we had some large Hail with some stones up to 4cm in diameter. Lots of thunder and lightning and some very heavy Rain. Well that was a totally awesome storm lasting at least 20 minutes, heaps of rip-roaring thunder (very loud at times), lightning (with numerous flangs right outside my office window), very torrential whiteout rain and even some marble-sized hail lasting a few minutes with some squalls. Flash flooding around my street. The huge red/orange cell went directly over the CBD & eastern suburbs. Rain from this event - 18mm at Ob Hill and 22mm for Rose Bay. (Had to add this, the crate that we use to throw junk mail in was washed off our footpath & found a few hundred metres down the road jammed under a car, just went to fetch it). Sutherland shire didn't get much, some light rain and a few flashes of lightning. God i hate living here, we always miss the good stuff. I headed hout and met Nick Moir at Rooty Hill and waited. We tried to intercept the cell south of Campbelltown - but we hit traffic and also I took the wrong turn off. So we did an about face and then Nick headed for the M5. I headed up the M7. Then I saw the towers exploding at the back end. I turned east of Horsley Park. You think I could ever catch up? No matter what I did the traffic lights and traffic just kept me out of the core by about 3 km. I then decided to head back home. Only a few pics today! Not a fan of driving in Sydney chasing storms. So many panic hazards. 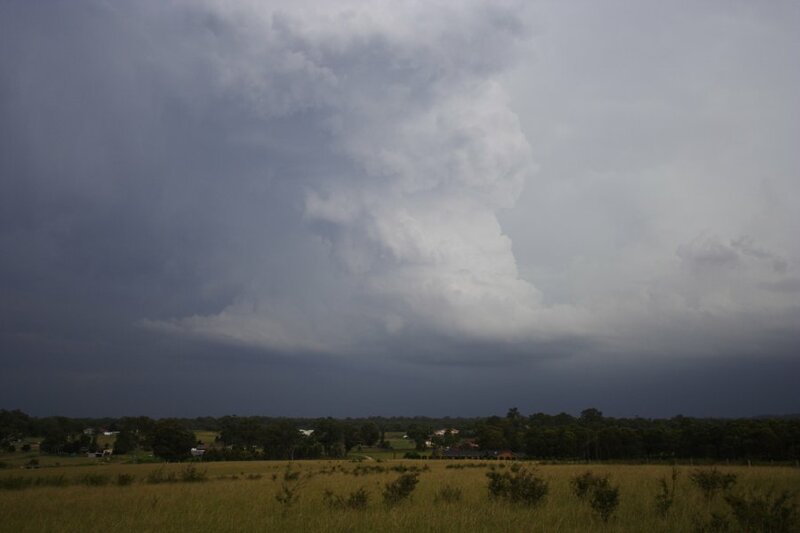 First is of the early cell over Lithgow that extended out towards Blizz's area. Some nice rumbles and updraft region however it suffered from a low DP and light winds. An area of updrafts I passed under earlier near Mt Tomah were starting to get their act together. I stopped just to the east of Mt Tomah and watched a nice dumping of 1cm hail fall until this base below came into view. This base would evolve into the severe storm that battered Bilpin and moved off to the Central Coast later that afternoon. Below are pictures of the hail that fell over the next hour in Bilpin with a flash flooding shot. Stones ranged from 1-2cm with the odd 3cm thrown in sporadically towards the start. At one point the Bells became an ice rink, was amazing to watch. Forgot to mention there is a really nice looking cell on Canberra Radar near Braidwood. Cell appears to be splitting judging by the latest radar scans. Mature cell close to the coast at this point - racing away! 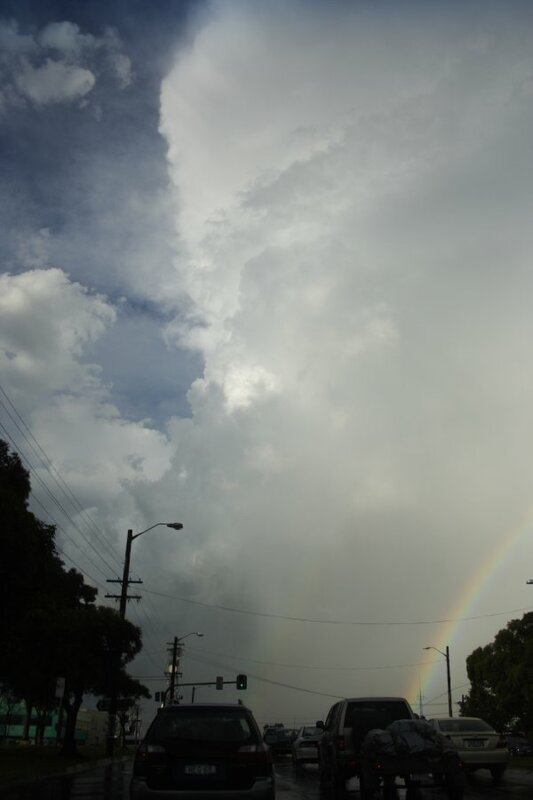 Note the hail shafts - there was stripped leaves near Flemington Markets marking the northern edge of the storm. Nothing much at Rydalmere. The cell that passed over Bankstown towards the city about 6:30 had some nice inflow (winds changed direction here and came up quite strong - also visible on the lower cloud/scud movement), lots of thunder but no lightning. Later saw some hits over to the east. As I write this though there is lots of lightning building to the west from another cell, some quite bright. The storm heading towards me from west of Parramatta isn't intense on radar but certainly generating lots of activity. If you want a good indication of where the weather is, it pays off to listen to the police frequency on your CB, if you don't have access to that sort of equipment, this website offers a live stream of the Sydney police band thats free to listen to. They will often report in if they are in a storm. The cell that hit the Sydney CBD about 6:20pm looked quite spectacular. It was rather green and had quite strong rotation on the north flank before it collapsed somewhat. No pics unfortunately. Just caught the squall line after work as it came across the Olympic site and headed east. Yes there was certainly some real time rotation in a cell that developed over Silverwater around 6pm, this lasted for a few minutes before decaying. The main cell heading east over Flemington certainly produced some very heavy rain and frequent cg's. 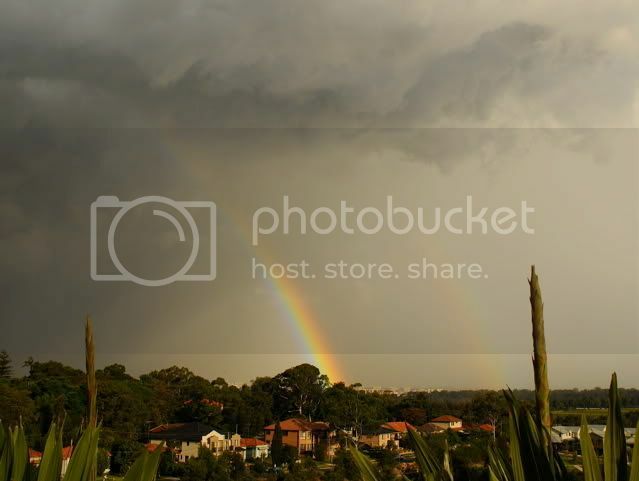 The following photos are of the only cg I captured and a nice rainbow from the outflow. Cheers, Con. Nice base there Con. It was what I wanted to go after the whole time but failed to get into position. I am glad you were in some decent position to get a view of it! One thing I can say about this was just south of Fairfield near the Hume Highway turn off, the storm began to produce lightning bolts from the back shear anvil - at least I saw in succession of about 3 minutes. Nice! 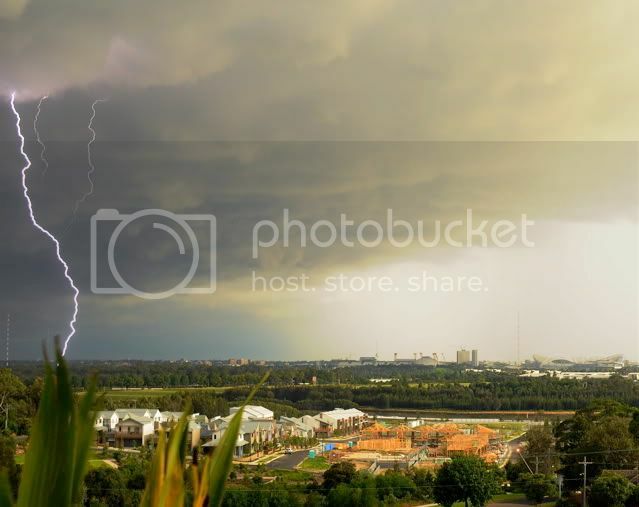 Beaut storm from what I viewed on the TV last night. The network showed footage of a massive dome just alive with lightning with dome to ground strikes galore. The structure was excellent to look at, huge cauliflower head. Some of the hail photos posted actually looks like it snowed! Received an email from chasers in the 'Gong who said the storm was going nuts there, they chased for over 650km round trip from start to finish - commitment! I should have some photos to post once they send them to me.